Destruct the rutz::trace object, accumulating time information in the stored rutz::prof.
Query whether we are unconditionally printing trace in/out messages. Set whether to unconditionally print trace in/out messages. Get the max nesting level for printing trace in/out messages. Set the max nesting level for printing trace in/out messages. Times and traces execution in and out of a lexical scope. This class cooperates with rutz::prof. rutz::prof objects are expected to have "long" lifetimes, and accumulate timing information over multiple passes. 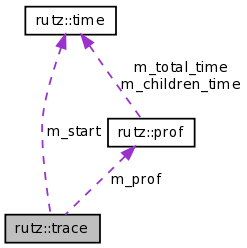 In each pass, a rutz::trace object should be constructed, which will pass its runtime info onto the rutz::prof, which then accumulates the timing info. Definition at line 76 of file trace.h. Store the current time internally (either the wall clock time or current user+sys rusage, depending on the current timing_mode). If use_msg, then print a trace-begin message to stderr showing the name of the given rutz::prof. Definition at line 123 of file trace.cc. Get the new time (either wall clock or user+sys rusage, matching whatever we did in the rutz::trace constructor. If we printed a trace-begin message, then also print a matching trace-end message. Definition at line 140 of file trace.cc. References rutz::prof::add_child_time(), rutz::prof::add_time(), rutz::prof::context_name(), rutz::backtrace::current(), rutz::prof::get_now_time(), rutz::backtrace::pop(), and rutz::backtrace::top(). This page was generated Wed Dec 3 06:56:46 2008 by Doxygen version 1.5.5.